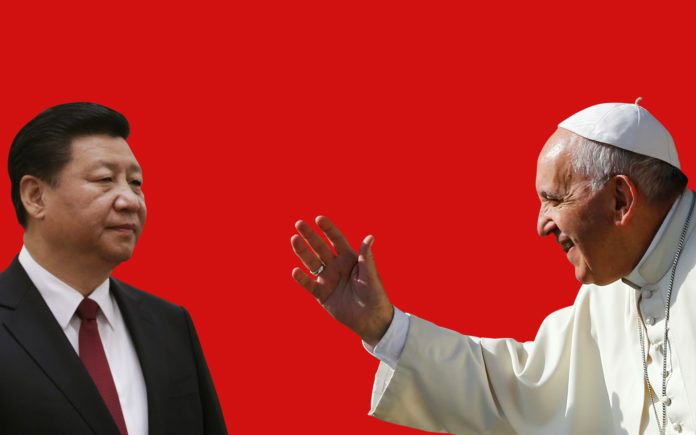 (TibetanReview.net, Sep30, 2018) – The Pope may have won a say in the appointment of Bishops in China following the signing of a historic “provisional agreement” in Beijing on Sep 22; however, the church there has made it clear that it will owe its allegiance to the atheist government while remaining independent of the Vatican. Besides, China’s ongoing “Sinicisation” of religions campaign bans all foreign influences in the country, which is bound to have implications on what degree of say the Pope will have on the appointment of Bishops in China. A press release issued by the government-approved Patriotic Association of Chinese Catholics and the Council of Bishops of the Church of China — neither of which have been recognized by the Vatican — said that “The Chinese Catholic Church ‘will continue to operate independently’,” reported lifesitenews.com Sep 28. “We love the country and the Church, we will carry forward the principle of independence and the concept of the sinicization of religion while remaining on the path that leads to socialist society,” the Chinese Church was quoted as saying. While “Independence” obviously means independence from the Vatican authority, “sinicization” refers to China’s ongoing campaign to co-opt Christianity, as in the case of all other religions, to make it subservient to the interests and concerns of the party and to do away with all foreign influence on religious matters. The report cited Asia News editor-in-chief, Fr. Bernardo Cervellera, as saying in a published analysis that some worry the new agreement transforms the Church into a “party instrument”. But this is what the ongoing sinicization campaign is about. Meanwhile, the Chinese government is supervising a five-year plan to make Christianity more compatible with socialism in which there will be a “rewrite” of the Bible, a prominent religious freedom activist has told the US Congress. One way in which they plan to Sinicize Christianity, Rev. Bob Fu, a former Chinese house church leader who immigrated to the United States in 1997 and founded the persecution watchdog organization China Aid, has said, is by “retranslating” the Old Testament and providing new commentary to the New Testament to make socialist ideals and Chinese culture seem more divine.